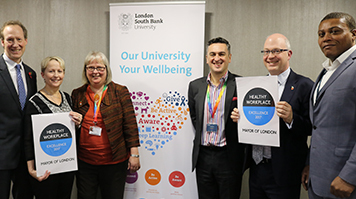 London South Bank University (LSBU) has been recognised for its dedication to supporting the health and wellbeing of employees by the London Healthy Workplace Charter, a Mayor of London backed programme. LSBU has participated in the programme for three years and this year was the first university to be awarded the highest level of achievement, receiving the Excellence level award. On November 13, Head of Health, Safety and Resilience Ed Spacey and Head of Sport and Recreation Phil Newman were presented with the award on behalf of LSBU at a special ceremony at City Hall. The award acknowledges that employers are increasingly recognising the link between healthy, happy employees and a more productive workforce, as figures show an estimated 914,300 adults of working age in London are affected by a common mental disorder such as anxiety and depression. To receive the award, LSBU passed a tough verification process and demonstrated its commitment to addressing wellbeing challenges by developing programmes across a wide range of areas, including support for mental health and wellbeing, smoking, alcohol and substance misuse, improving physical activity and promoting healthy eating. “We are delighted to have achieved the Excellence-level accreditation from the London Healthy Workplace Charter. Learn more about health and wellbeing at LSBU.